World Christian Encyclopedia (David A. Barrett; Oxford University Press, 1982) estimated that there were almost 21,000 denominations in 1982. , The updated World Christian Encyclopedia (Barrett, Kurian, Johnson; Oxford Univ Press, 2nd edition, 2001) estimated at least 33,000. The Center for the Study of Global Christianity at Gordon-Conwell Theological Seminary estimated 34,000 denominations in 2000, rising to an estimated 43,000 in 2012. These numbers have exploded from 1,600 in the year 1900. Why? I mean, Christians all serve the same God and follow the same Book, right? I mean, seriously, 1600 in 1900 seems like a high number. But 43,000? What gives? Quite simply, the flesh. And honestly, we all struggle with this. It is very difficult for even the most pious believer to approach the Bible with complete submission. Generally, we all take preconceived ideas into our Bible study. Our opinions play a major factor in our doctrine, sadly. I made a concerted effort several years ago to approach the Bible in my daily reading with a completely open mind. Now, this doesn’t mean I set aside whatever knowledge I have from other passages of Scripture. But, I want to be open to what the passage I may currently be reading says. I want to know what the Bible tells me – not what I want it to say. Every day I have to commit to that and every day it is a struggle. 43,000 denominations (and growing) prove that I am not the only one struggling with it. Did you know the Bible is enough? We don’t need creeds or covenants or any other set of rules. God inspired the Bible to be written so we’d have a guidebook. And it’s enough. 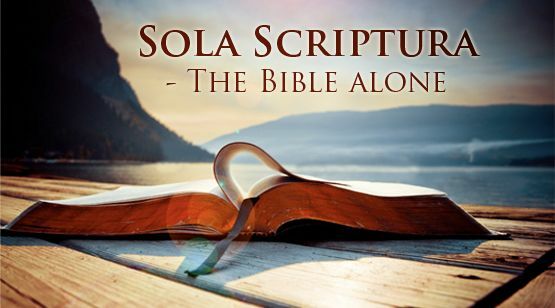 “All Scripture is given by inspiration of God, and is profitable for doctrine, for reproof, for correction, for instruction in righteousness, that the man of God may be complete, thoroughly equipped for every good work” (2 Timothy 3:16-17). By following the Bible alone, you can be “thoroughly equipped for every good work”. Simply, nothing else is necessary (except the leadership of the Holy Spirit, of course). Child of God, let us commit together to read God’s Word and find out what it alone has to say. Let’s trust it even when we don’t understand it. Let’s commit to the Bible being true and enough. Let’s not add to it or take from it. Let’s seek to be “thoroughly equipped for every good work” by following the Bible and it alone.